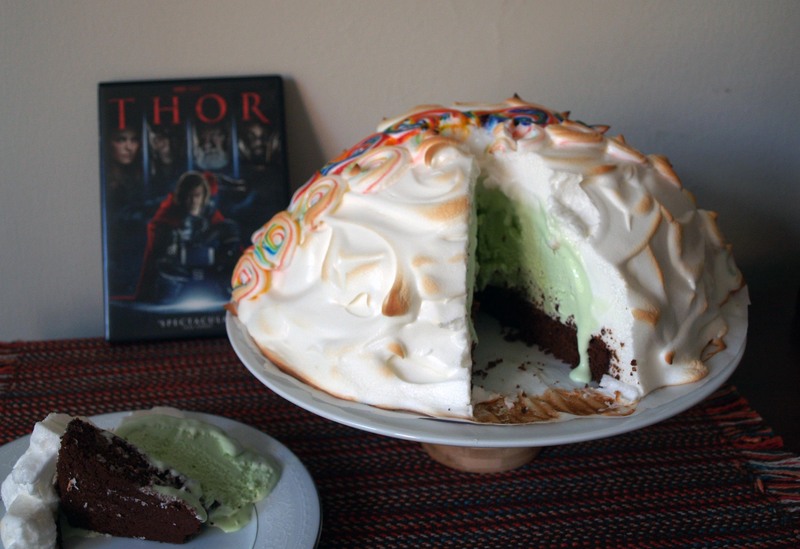 Thor’s Mint Chocolate Baked Alaska | I Wanna Bake! I remember being super psyched for this movie when it came out, and I was not disappointed. Admittedly, the CGI is a little weird at times, but I still stand by the mighty Thor. On a related note, I’m really into the recent Thor comic book series and subsequent Mighty Thor line. Beautiful artwork, accessible story lines, and a female Thor. What’s not to like? I’d definitely recommend it if you’re into comic books. But I digress. According to the IMDB summary of the movie, “The powerful but arrogant god Thor is cast out of Asgard to live amongst humans in Midgard (Earth), where he soon becomes one of their finest defenders.” After intruders break into (what amounts to) the royal vault with the help of Loki, Thor reignites the ancient conflict between the Asgardians and the frost giants of Jotunheim. As punishment for his arrogance, Odin declares Thor unworthy and sends him to Midgard to learn his lesson. There, he meets and befriends scientists Jane Foster, Eric Selvig, and Darcy Lewis, who help him to develop a sense of humility in his human form. Through a selfless act, Thor regains his worthiness and is again able to wield his hammer (as well as fly, summon lightning, etc.). Soon after, when Thor returns to Asgard, he chooses to destroy the Bifrost (rainbow bridge) in order to save Midgard from destruction, severing his link to his human friends in the process. While I pulled recipes together from a couple different places, I didn’t make too many changes to the actual recipes themselves. For the ice cream, I opted for peppermint extract instead of fresh mint leaves. I’ve tried it with the mint leaves before and didn’t think it had sufficient flavor. For the cake, meringue topping, and baking instructions, I looked to my trusty copy of Joy of Cooking. I added some instant coffee granules to the chocolate Genoise sponge cake recipe to accent the chocolate flavor a bit (and as a nod to the scene in the movie where Thor smashes his mug in appreciation of his coffee). 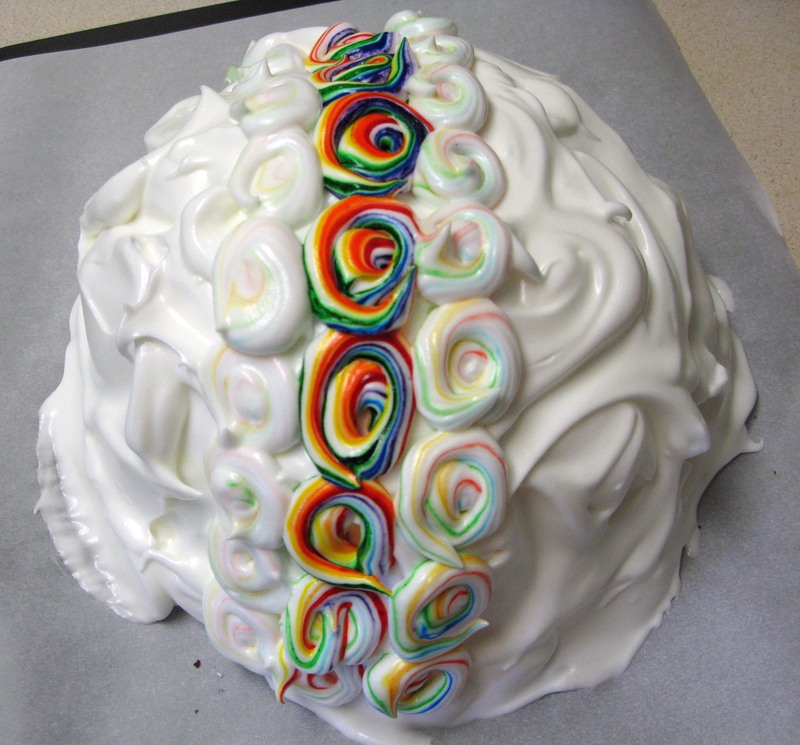 I also colored a small portion of the meringue rainbow so that I could add some thematic decoration to the top. Other than that, the recipes are mostly as written. I’m not going to lie, this is definitely a “dirty every kitchen tool and dish you own” kind of dessert. If you make all of the components from scratch, you will need something to churn your ice cream with, a large bowl, a 9″ cake pan, a rimless baking sheet, an electric mixer, various sizes of saucepans, and several mixing bowls, among other usual kitchen bits and bobs. You can definitely use store-bought ice cream and cake from a box instead. I wouldn’t judge you for shortcutting this a bit. However, while this takes a lot of time and tools, none of the steps are particularly difficult. 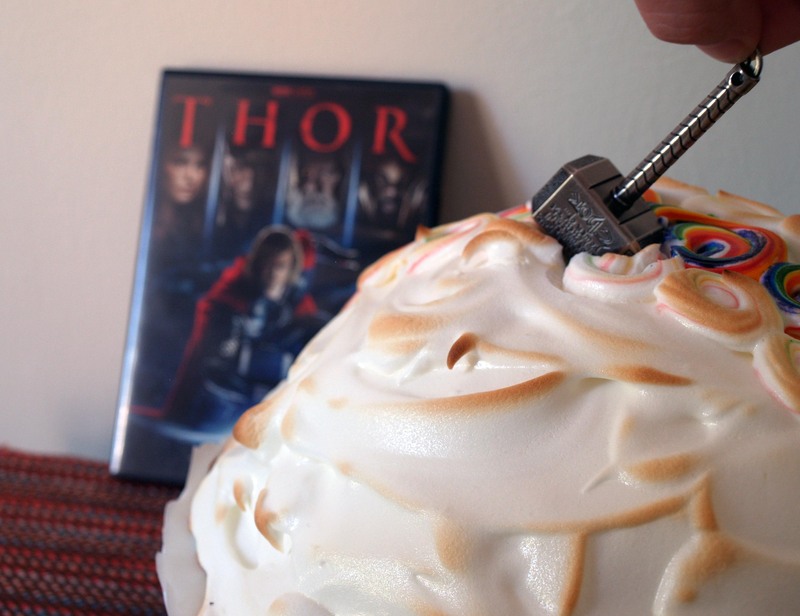 If you take your time and pay close attention to what you are doing, you can recreate this baked Alaska, no sweat. Anything related to Norse mythology pretty much begs for metal. If that’s not your style, perhaps the movie soundtrack is more your speed. The first component to make is the ice cream. You will need an ice cream maker of some sort (I use this handy gadget). If you are using the one I use, be sure to freeze the bowl for at least 12 hours before you plan to churn your ice cream. 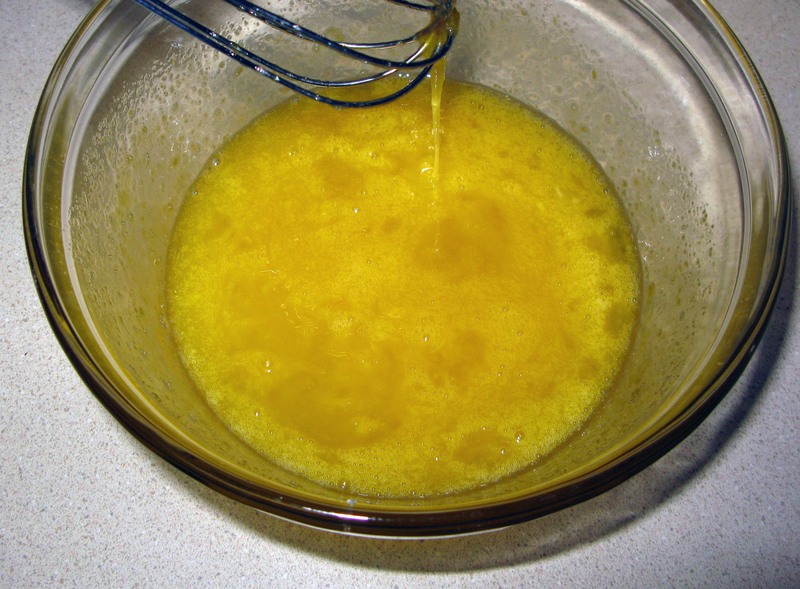 In a medium bowl, whisk the egg yolks until smooth. Set aside. 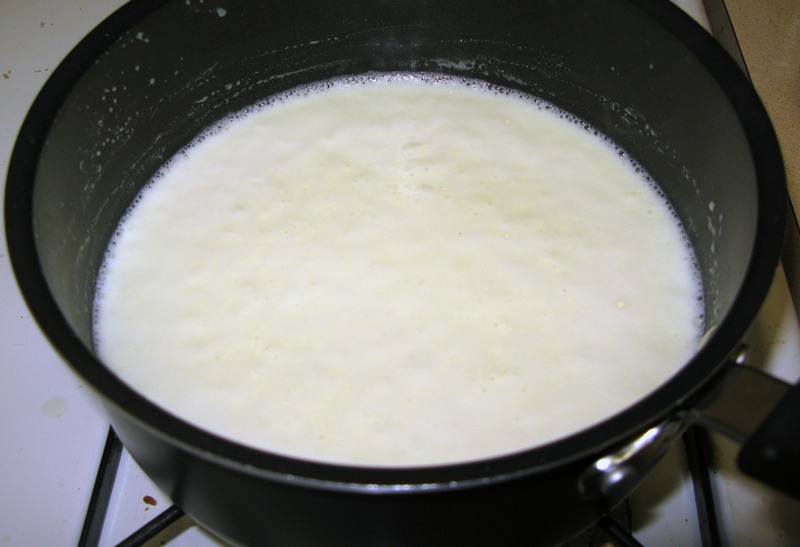 Whisk together the heavy cream, milk, sugar, and salt in a medium saucepan and bring to a simmer. Cook, whisking constantly, until the sugar is completely dissolved (about 5 minutes). 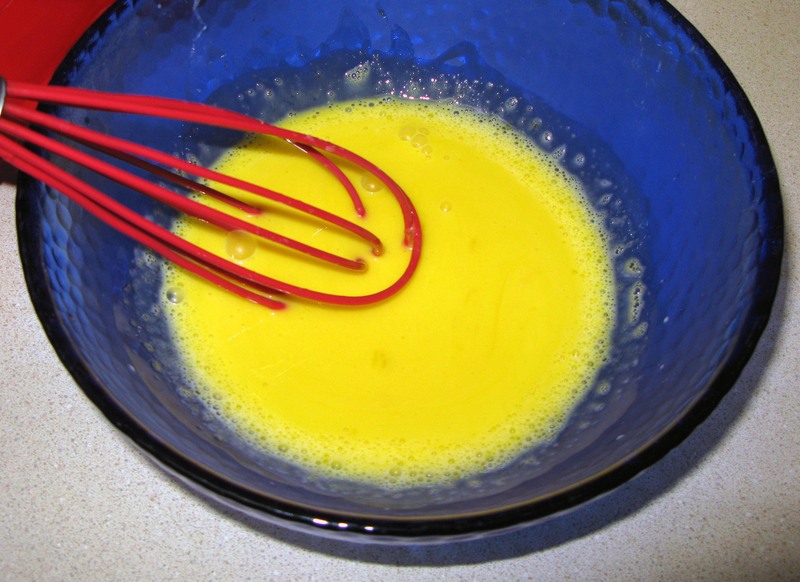 Pour approximately a third of the hot cream mixture into the egg yolks, whisking quickly the whole time, until smooth. 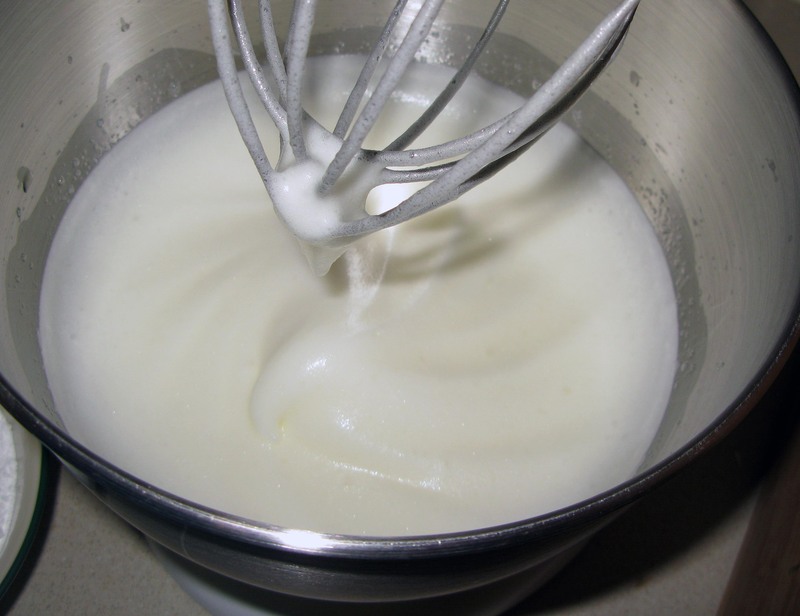 Whisk in the remaining cream mixture until smooth and return the mixture to the saucepan. Heat the mixture over medium heat, stirring continuously, until it is thick enough to coat the back of a spoon. 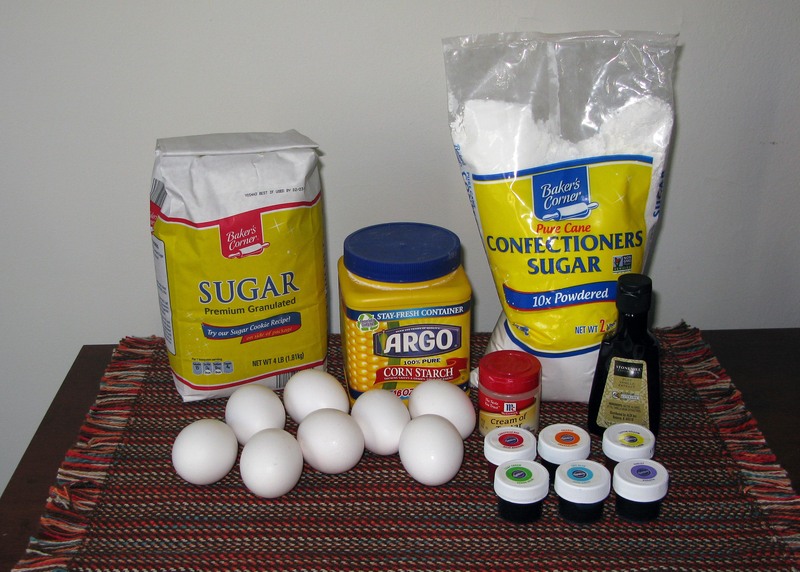 Stir in the peppermint extract and food coloring (if using) until fully-incorporated. Strain the ice cream base through a fine-mesh strainer into a heat-proof bowl and leave it to cool to room temperature on the counter. When the ice cream base is approximately room temperature, press a layer of plastic wrap directly onto the surface (this prevents it from forming a skin) and refrigerate for at least four hours. When you are ready to churn your ice cream, first prepare the bowl you will mold your baked Alaska in. 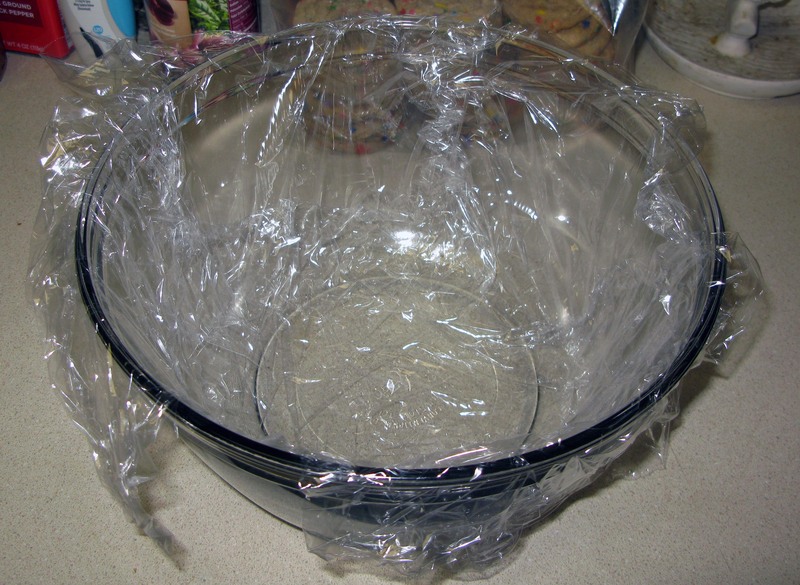 Line the inside of the bowl with plastic wrap so that it is completely covered and the plastic wrap hangs over the edge about an inch. 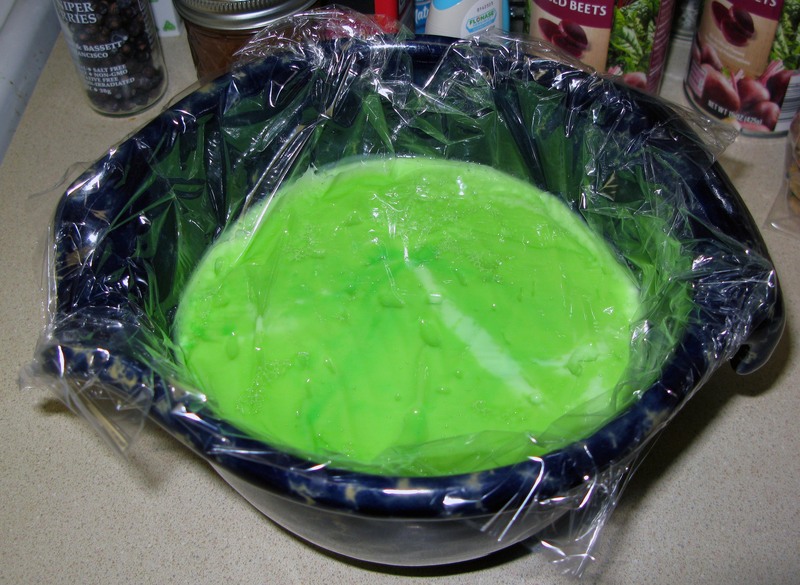 Take your ice cream base out of the fridge and remove the plastic wrap. Churn according to your ice cream maker’s directions. Scrape the ice cream into the prepared bowl and smooth the top with a spatula. Place the bowl in the freezer to harden the ice cream for at least four hours. 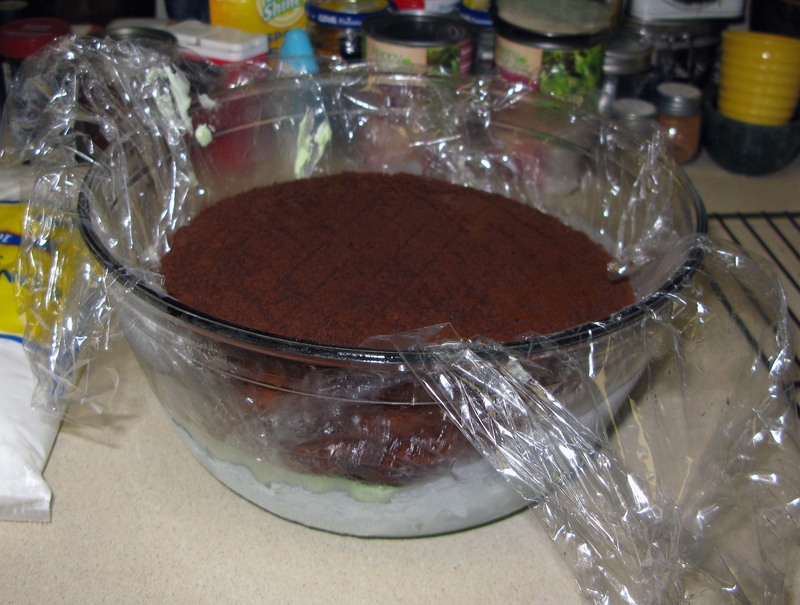 While the ice cream is hardening, make the cake layer. 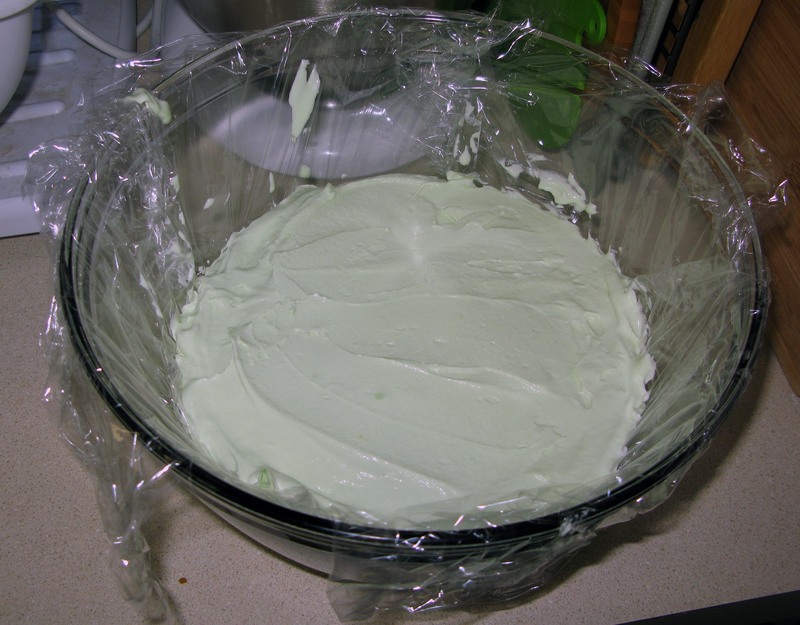 Preheat your oven to 350°F and line the bottom of a 9″ cake pan with parchment paper. 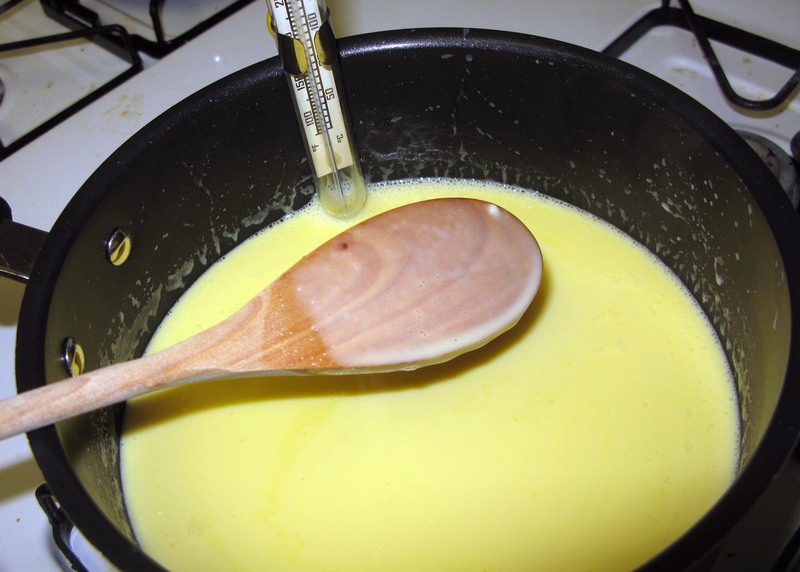 Melt the butter in a small saucepan and set aside. 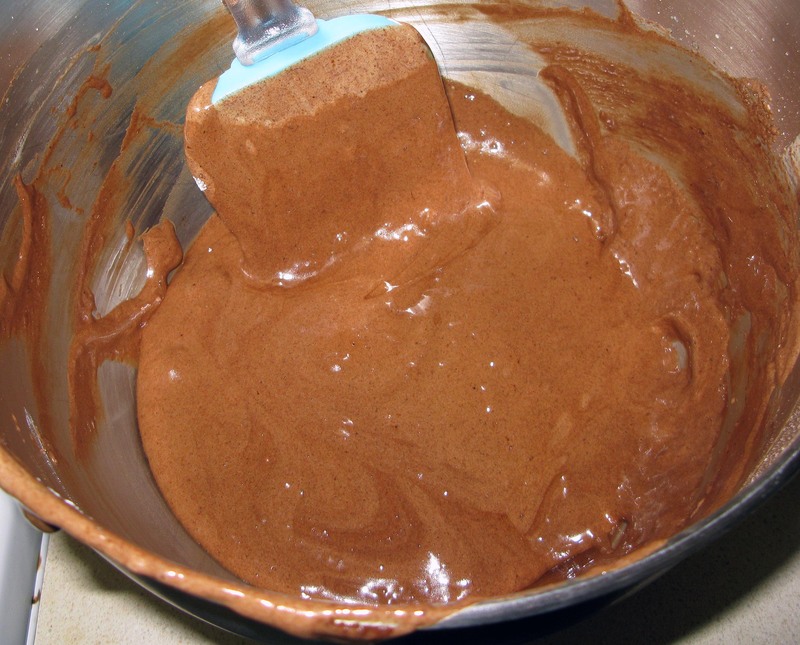 In a medium bowl, whisk together the cake flour, cocoa powder, and coffee granules until well-mixed and aerated. Fill a large skillet approximately halfway with water and bring it to a simmer. 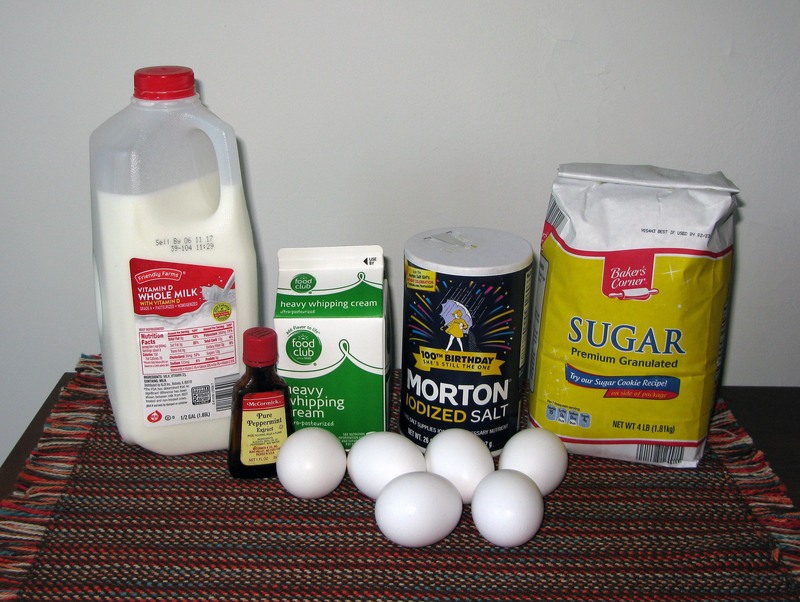 In a medium, heat-proof bowl, whisk together the eggs and sugar. 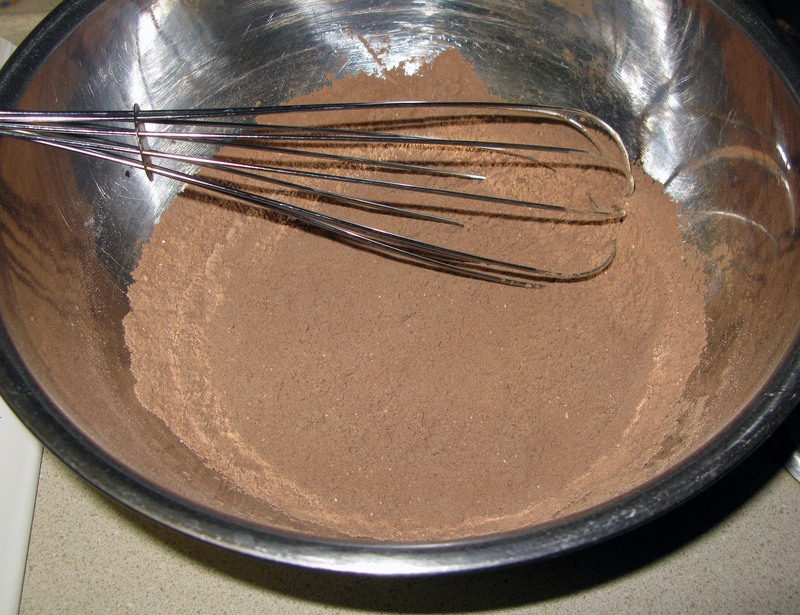 Place the bowl inside the skillet of simmering water and whisk continuously until the egg mixture is warm to the touch. 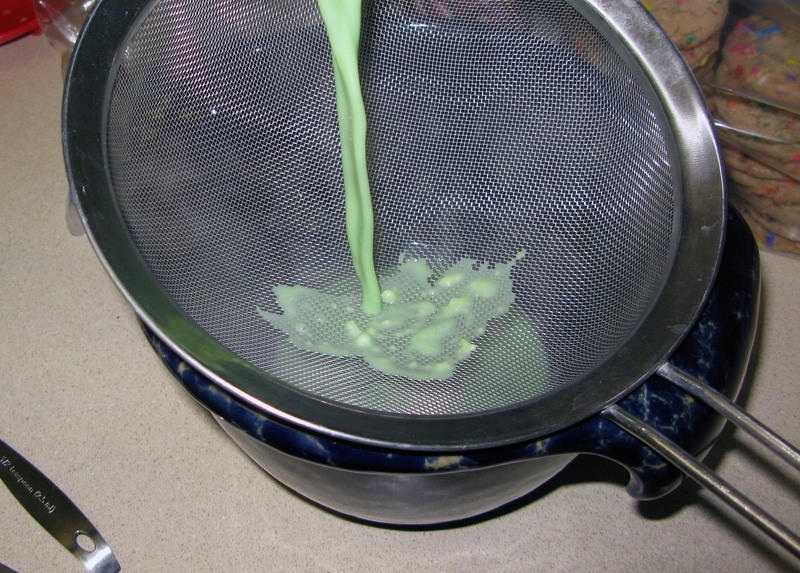 Remove the bowl from the water and transfer the mixture to a stand mixer. 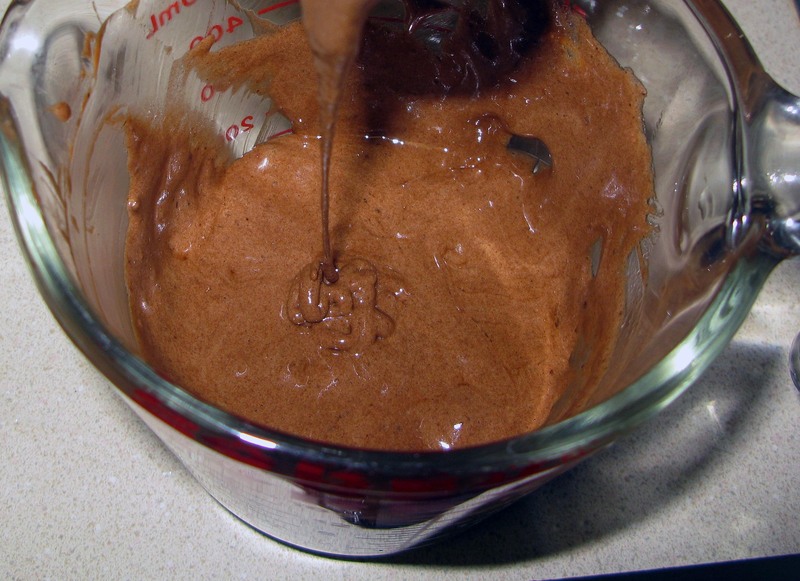 Beat with the whisk attachment until it approximately triples in volume (about five minutes). 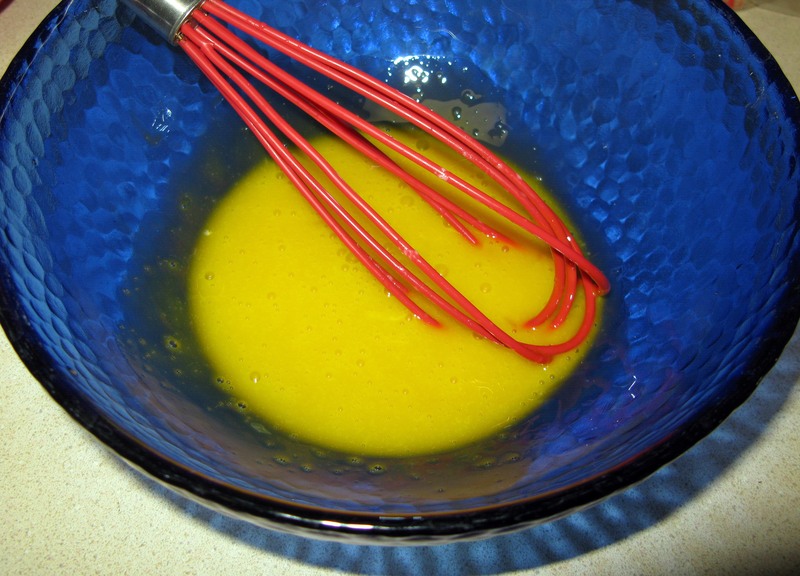 When you pull the whisk out of the egg mixture, a continuous ribbon of egg should stream into the bowl. Sprinkle a third of the flour mixture across the top of the bowl and gently fold it in with a rubber spatula until it is fully-incorporated. Repeat twice with the remaining flour. Reheat the melted butter and transfer it to a glass measuring cup or small bowl. 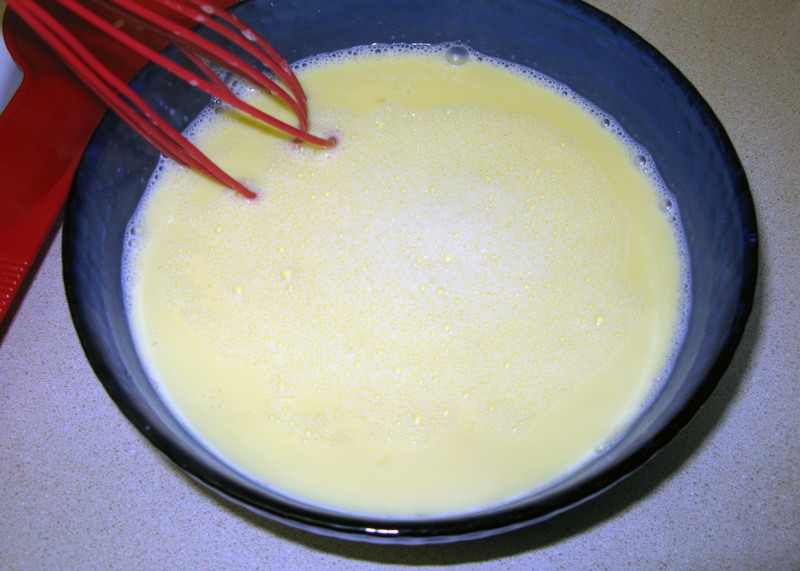 Pour approximately ¾ cup of the cake batter into the hot butter and fold them together until smooth. Scrape the butter batter mixture back into the remaining batter and fold together until well-combined. Scrape the cake batter into the prepared cake pan and bake for about 15 minutes, or until the cake begins to pull away from the edge of the pan and the top springs back when lightly pressed in the middle (the dark spot on the cake below is from me testing it too soon and leaving a dent). Leave the cake to cool in the pan for 10 minutes, then run a sharp knife around the edge and flip it out onto a cooling rack (remove the parchment paper from the bottom in the process). Allow to cool completely. When the cake is cool and your ice cream has hardened, it’s time to stuff it into the bowl with the ice cream. Mine was about ½” too big in diameter, so I just carefully squished it in and it worked out fine. If yours is much bigger than that, you might need to trim the edge a little to fit into the bowl. Regardless, at this point, press the cake, top facing the ice cream, into the bowl. Return the bowl to the freezer while you prepare the meringue topping. Preheat your oven to 450°F and line a rimless baking sheet with parchment paper. If you don’t have a rimless baking sheet, you can try using a regular cookie sheet upside down (veeeery carefully), or you can just serve it off the cookie sheet. 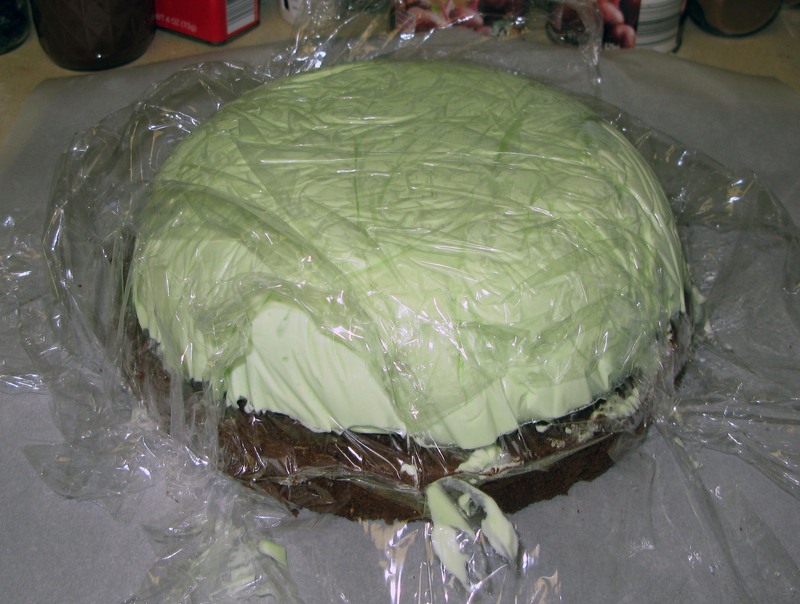 Prepare a 12″ piping bag with a small start tip (I used a Wilton #21) and fold the edge over. Place the bag inside a tall drinking glass to keep it standing up. Using a clean paint brush, carefully paint 2-3″ stripes of food coloring in each color of the rainbow inside the bag up to the edge of the coupler or tip. In a small saucepan, stir together the cornstarch, granulated sugar, and water. 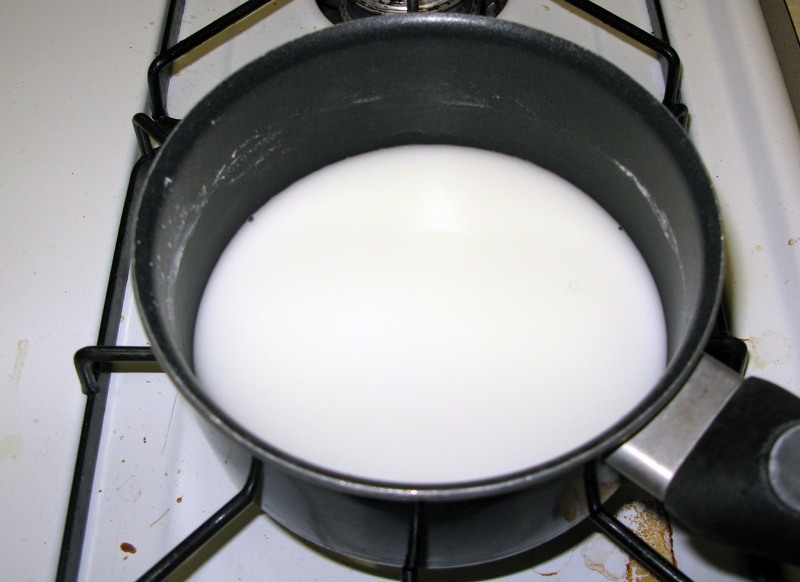 Bring the mixture to a boil over medium heat, stirring quickly and continuously. 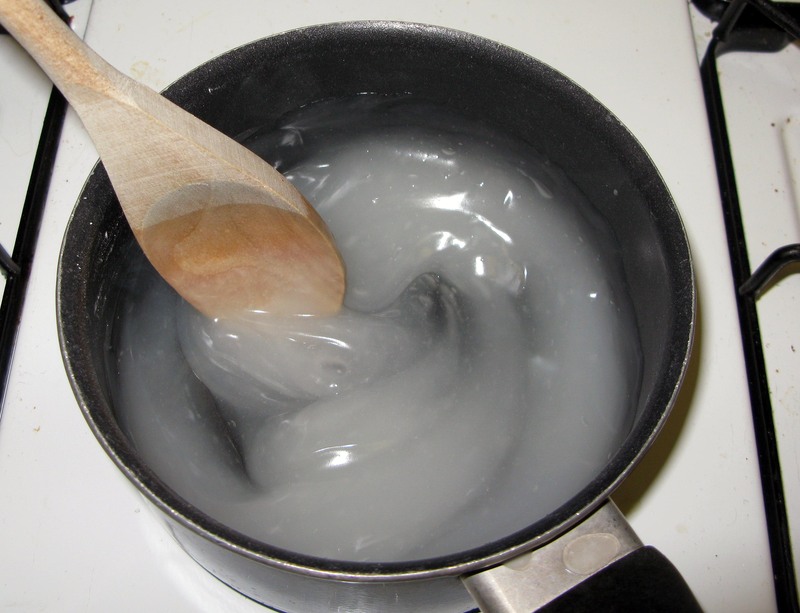 Cook for 15 seconds to form a thick paste, then remove the saucepan from the heat and cover it. 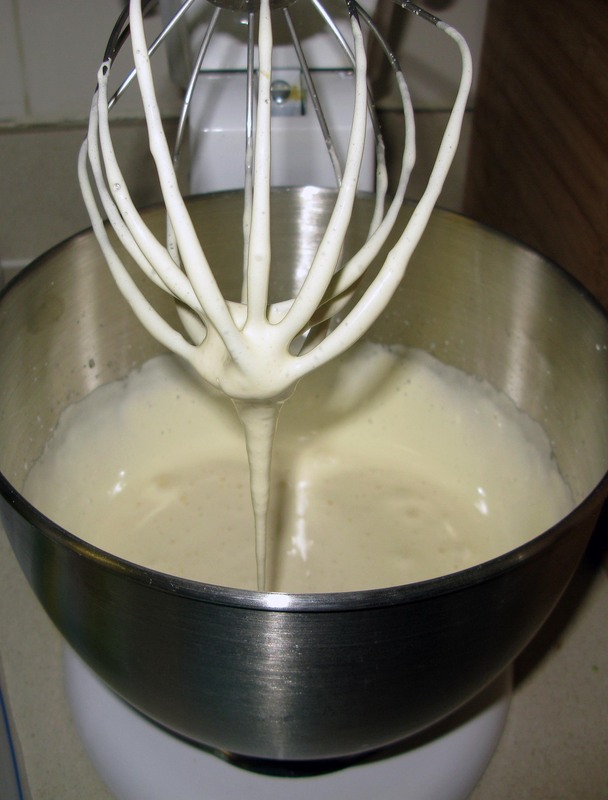 Using a stand mixer with whisk attachment, beat the egg whites until they are foamy. 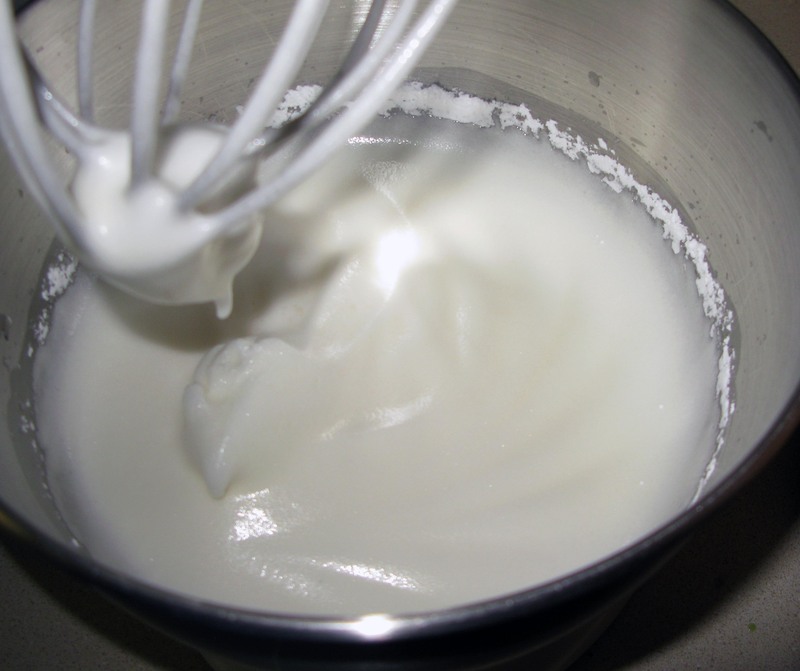 Add the vanilla extract and cream of tartar and beat on medium speed until soft peaks form. 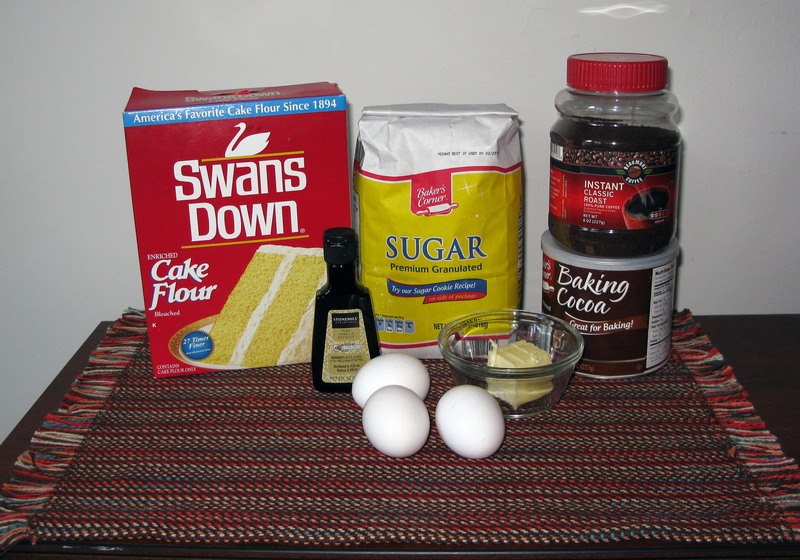 Reduce the mixer’s speed to the lowest setting and add in the powdered sugar 1 tablespoon at a time, making sure that the sugar gets fully-incorporated after each addition. 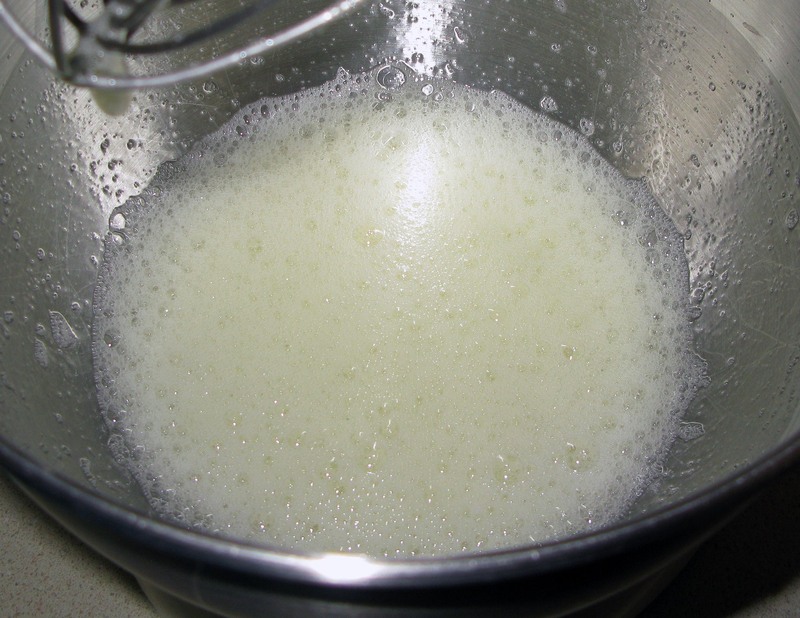 Increase the mixer’s speed to high and beat until stiff, glossy peaks form. Reduce the mixer’s speed to the lowest setting again and add in the cornstarch paste 1 tablespoon at a time as you did with the powdered sugar. Increase the speed to medium and beat for 10 seconds. 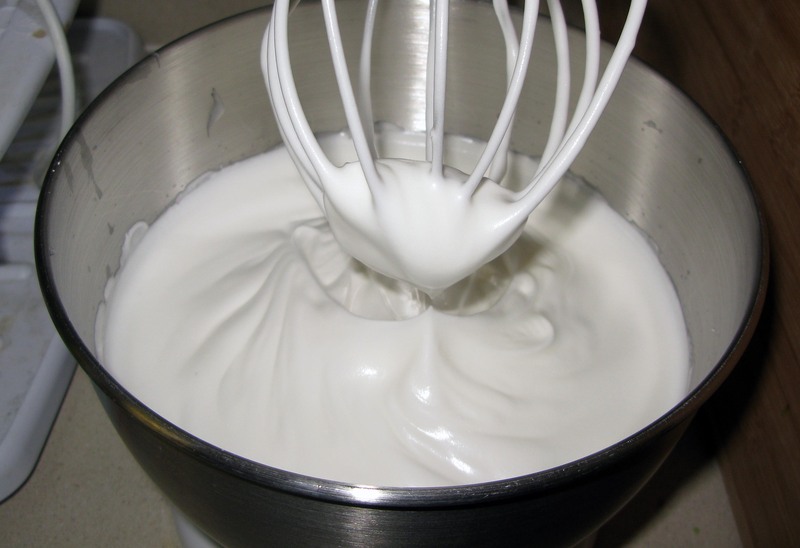 Fill the piping bag you prepared earlier approximately halfway with the meringue topping and twist the top shut. 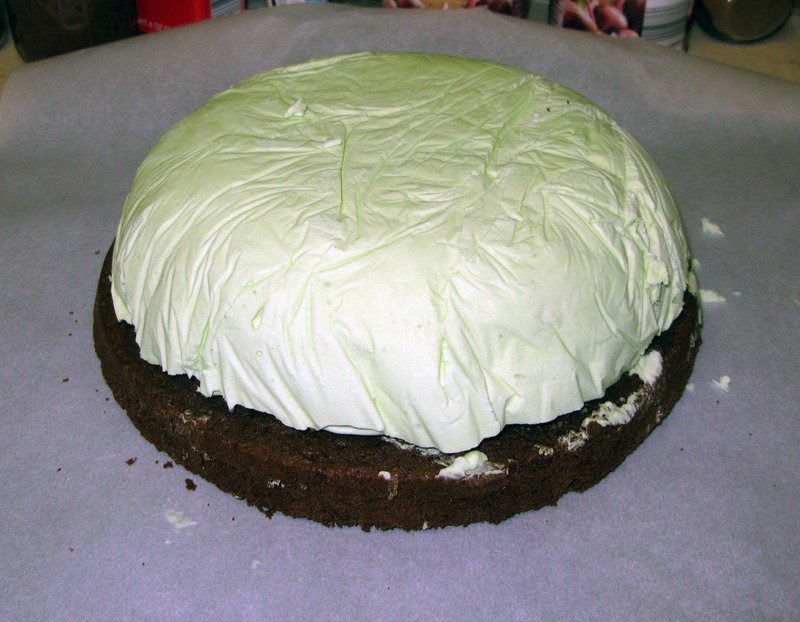 Remove your ice cream and cake from the freezer and carefully turn it out onto your rimless baking sheet. This is best done with two people if you have an extra helper around. Remove the plastic wrap from the top and discard. Spread the remaining meringue all over the ice cream and cake, making sure that it is fully-attached to the parchment paper. You don’t want any holes. 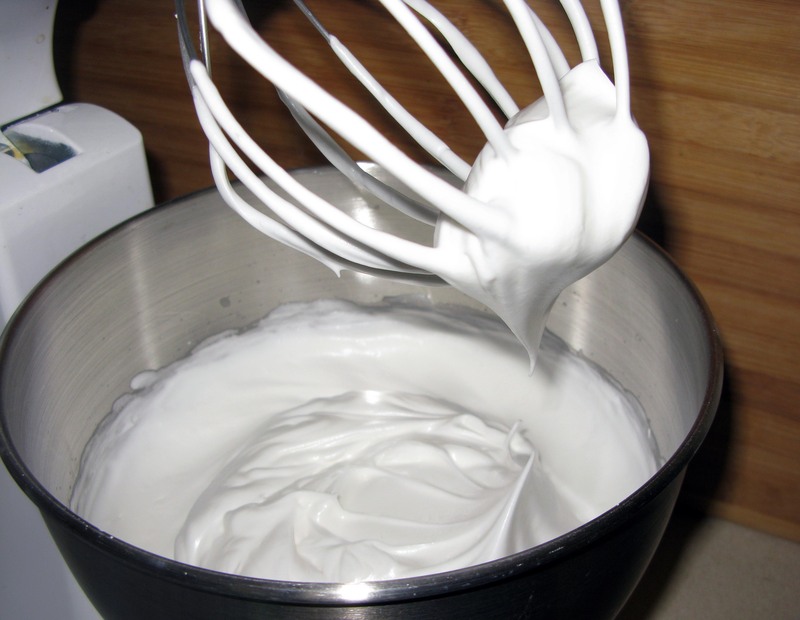 Swirl the meringue decoratively with a spatula or knife. This not only looks nice, but gives the meringue more surface area, which helps to insulate the ice cream underneath (yea for science!). 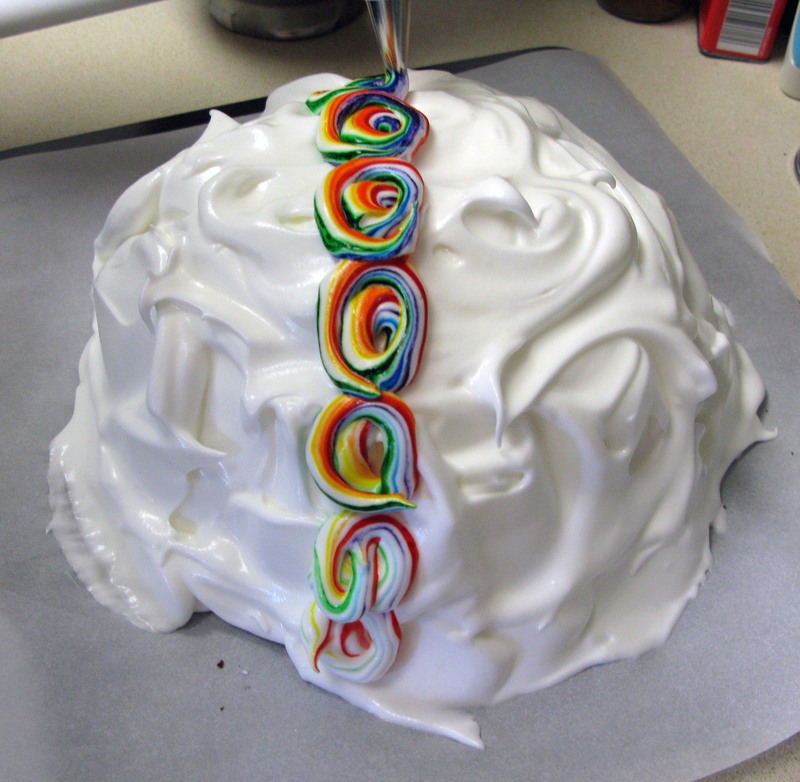 Squeeze meringue out of the piping bag until it starts to come out rainbow. Pipe an arc of rainbow swirls across the top of the baked Alaska. Pipe another row of swirls on either side of the first to use up the remaining meringue (it will run out of color, but it still looks nice either way). Bake for 5 minutes, watching carefully the whole time. Remove the baked Alaska from the oven as soon as the peaks are browned. 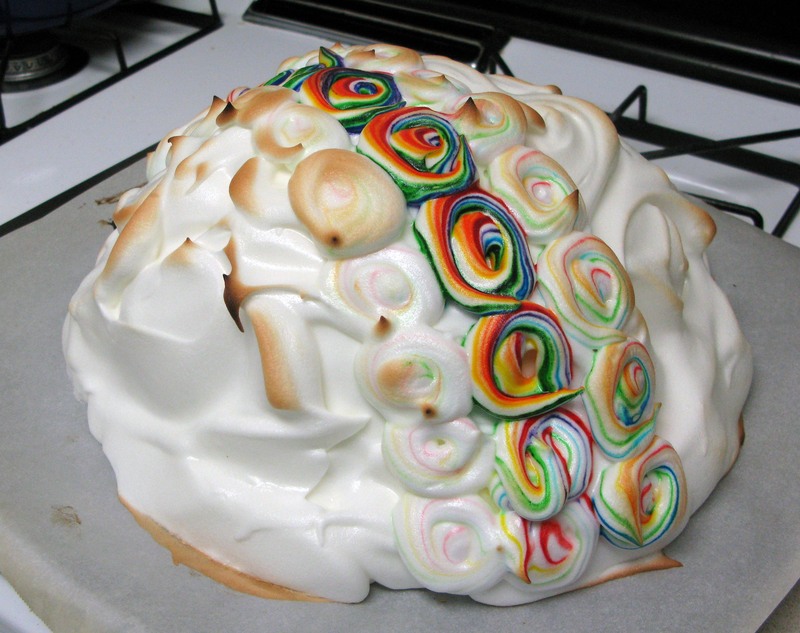 If you used a rimless baking sheet, you can carefully slide the baked Alaska onto a serving platter. Serve immediately and freeze leftovers in airtight containers.